I have something that may help you in resizing parts of armor. I found it on 405th, it's for Corvus Armor but I believe it will help to resize parts properly to your height. The only problem is that there is just scale. 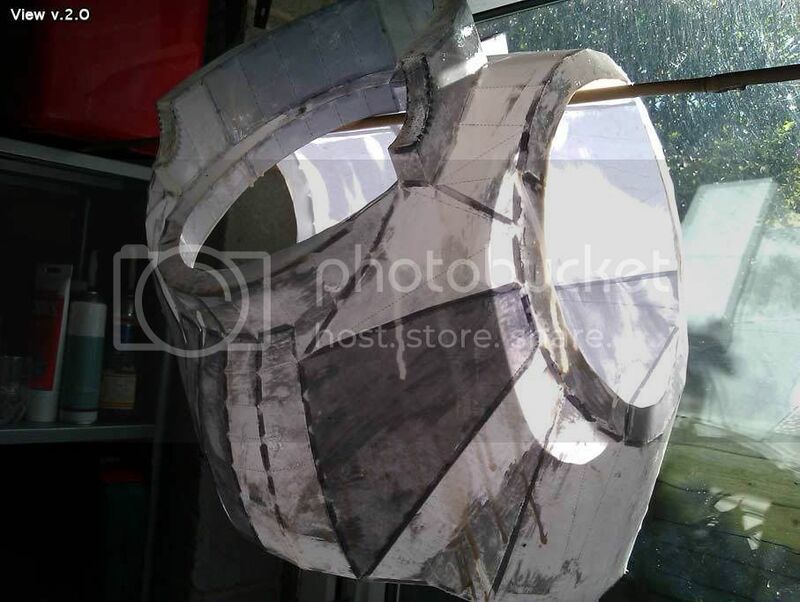 I think the easiest way to make it good will be to download parts of corvus armor from here http://www.405th.com/showthread.php/...ighlight=beaky resize them with the table of scales and put the sizes into your project in mm. Last edited by el_gringo_dado; 06-20-10 at 10:20 PM. 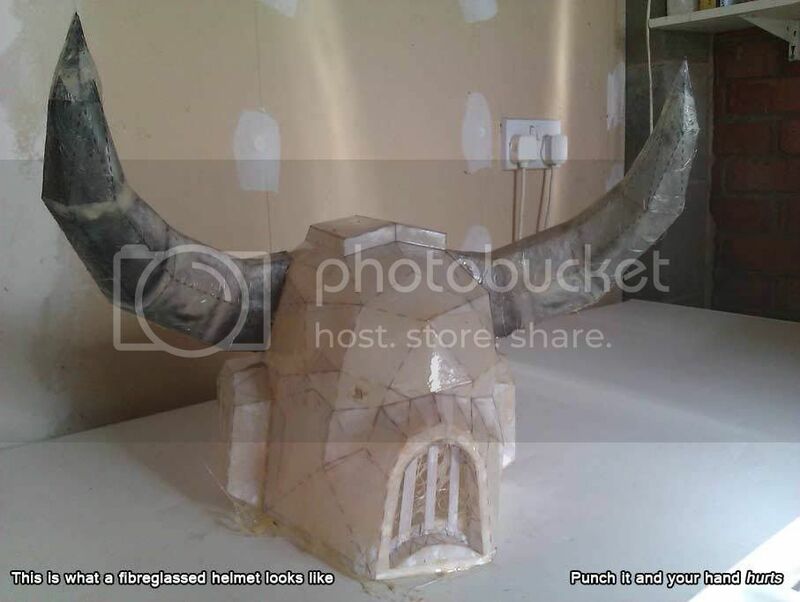 The helmet is pretty much done, just need to add a little more fibreglass to the horns and maybe the inside top. After that, I’ll take a dremmel to it and just kinda tidy it up. The little bits of fibreglass sticking out over the flaps and edges? They’ll be sawn off and ground down to make it relatively flat. After that, I’ll be able to start doing the next stage – bondo. The shoulders have been frustrating. It’s been difficult to keep their shape, and as a result minor depressions have occurred around the surface. I’ll have to fill it in with the bondo, or pass it off as battle damage, or just cover it in skulls. 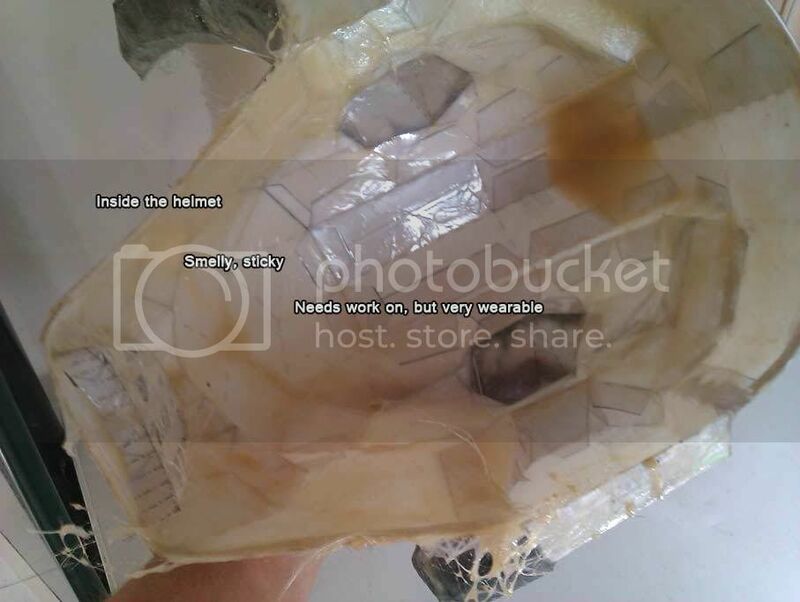 For future reference, when fibreglassing the inside of the shoulders, put it in a suitably sized bucket so it’ll keep its shape, rather than putting it on a flat surface and letting it deform slightly. This bad-boy’s next. 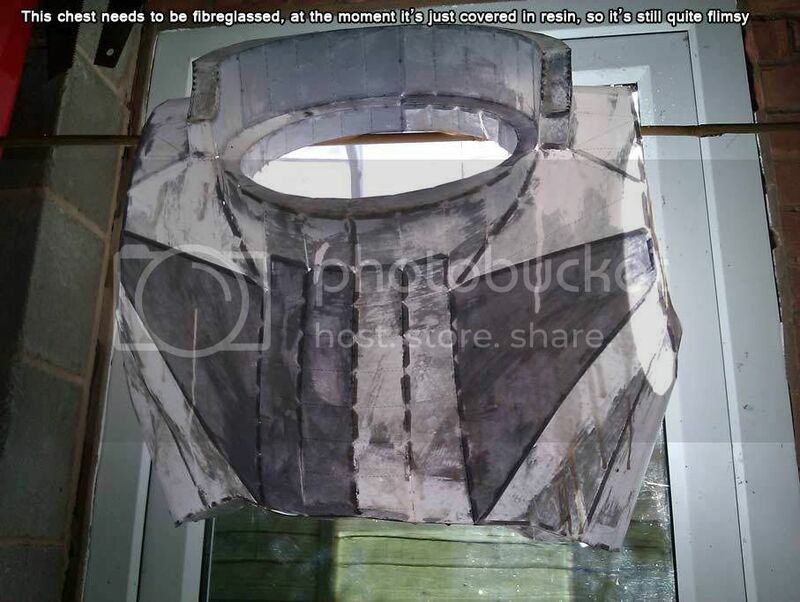 I’ve got to fix a slight tear at the back (probably with duct tape) and then I’ll start fibreglassing the inside. 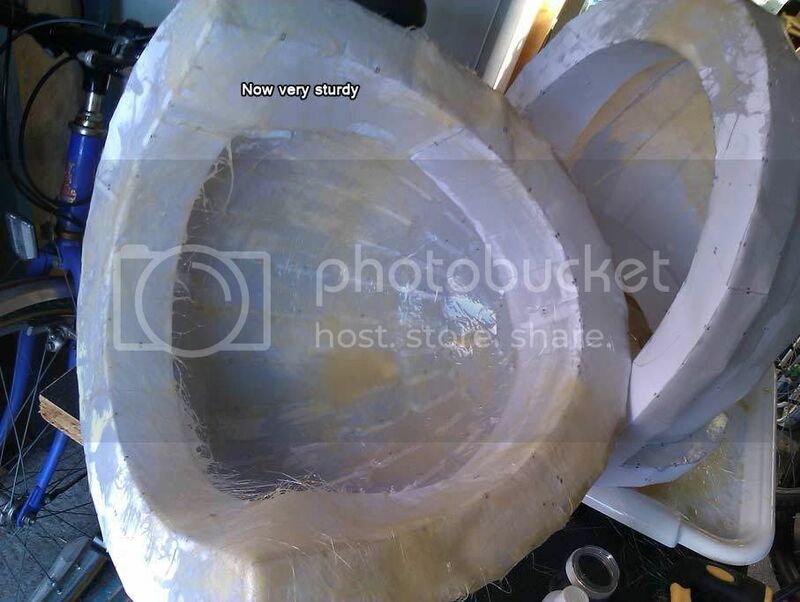 This will probably be quite difficult, it’ll be the largest (and most unstable) thing to fibreglass yet. Not sure how I’ll manage this. Tonight, however, I’ll finally start building the legs and see how they fit. Then I’ll fibreglass those, start building the cardboard backpack (epic project alone). Wish me luck, daemon spawns. Fine work. This is a considerable undertaking. Looking forward to seeing how it turns out. My advice if you want to keep shape of thing. Use hot glue. Stick the second layer of paper inside the part by hot glue. I tried it, it work's. holy crap geif so i can wear that playin dow!!!!!!!!!!!!!!!!!!!!!!!!!!! My only suggestion would be wire armatures, something custom-made that supports your parts in all the critical spots. Even if you bought a dozen metal coathangers and bent them to shape, it would be better than hanging them on a single dowel like your torso, or in the top of a bucket. 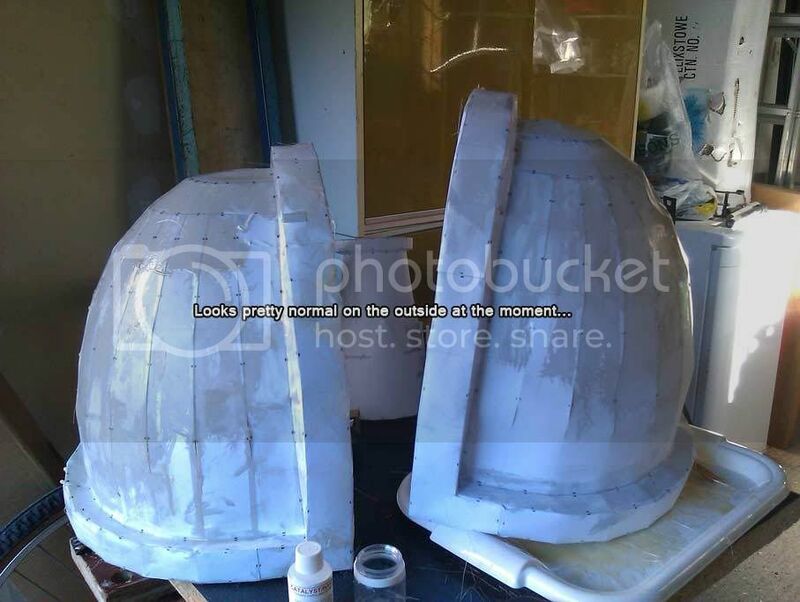 Regarding the minor collapses in your armour, with a thick enough coat of bondo and some patient sanding, you can work those out. With enough time and patience you could smooth out the 'polygons' of the papercraft model. "Oh, they'll never hit us from all the way over th-"
this is too legit and simply too freakin epic to describe in mere words. that's awesome, can't wait to see it done keep us updated!